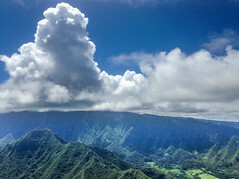 Massive booming towers of cumulus were fed by ripping strong thermals today at Kahana. Light northeasterly conditions generated barely enough ridge lift to stay above ridge height, but hooking into one of those spirited rippers promised a quick ride to the base of the boomers forming above. If not higher! It was a super fun day to connect strong thermals across the neighboring valleys and ridges with an old school double chronic. It almost turned into a triple, starting with an extra bay crossing. Those thermals were so sweet it was just hard to stop! But after four hours in the air, good sense prevailed, and it was time to head in for refreshments. Roll call: Woody, Steve, Marc, Ryan, Bavarians Wolf and Peter, Ike, Gaza, Duck and me. We are going to have to get a seperate file just for Woody's intro's. They are getting buried. I flew MPU today and had a great flight although all alone with an occasional path cross with Maui Doug was it. Hmm, just realized the title kind of sounds like it's going to be a story about farts. I guess it is about old farts anyway.